Una solución estándar lista para usar para fijar componentes con tuercas enjauladas que simplifica la adquisición y la instalación. Tornillo M6 x 12 y M8x12 para tuerca enjaulada. Screws for fixing components to cage nuts. A standard off the shelf solution compatible with cage nuts that can be fixed to the enclosure's frame and profile system. 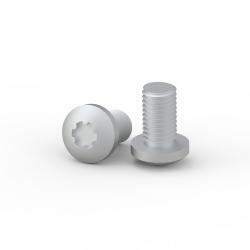 The screws can be used to fix components to the enclosure's frame or to profiles, simplifying the procurement and ensuring that components can be installed easily. Screws should be used in combination with cage nuts, CNM.